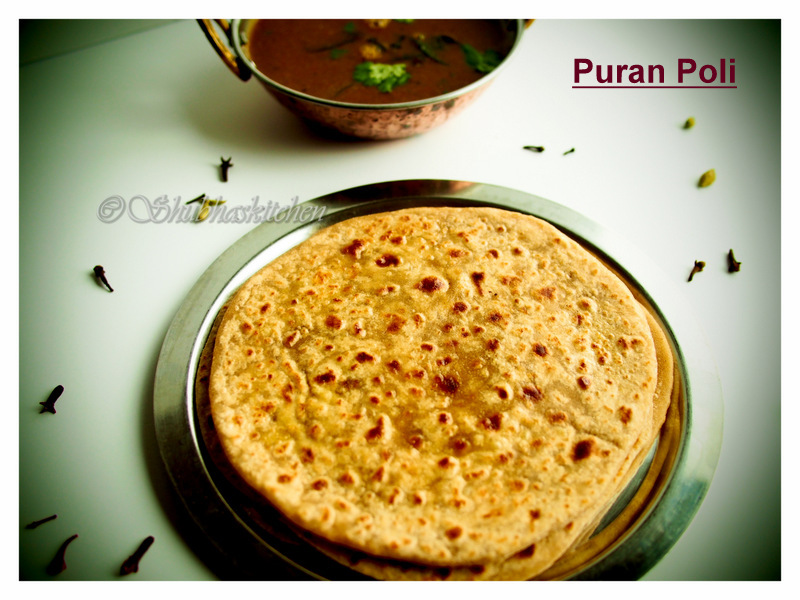 Puran Poli is a famous flatbread that belongs to the Maharashtrian cuisine. "Puran" in marathi means the filling while "Poli" means bread. 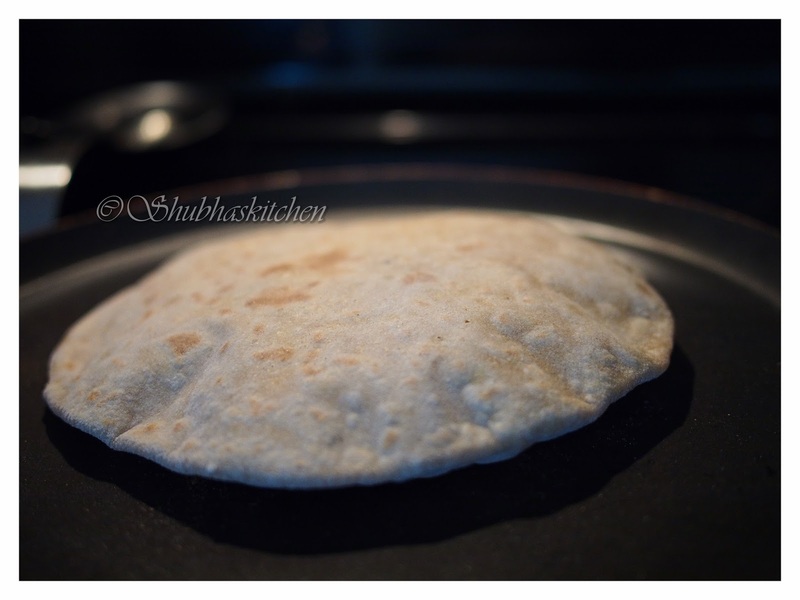 So Puran Poli is a flatbread stuffed with sweetened split chick pea filling. This is usually prepared in festivals in Maharashtrian households. 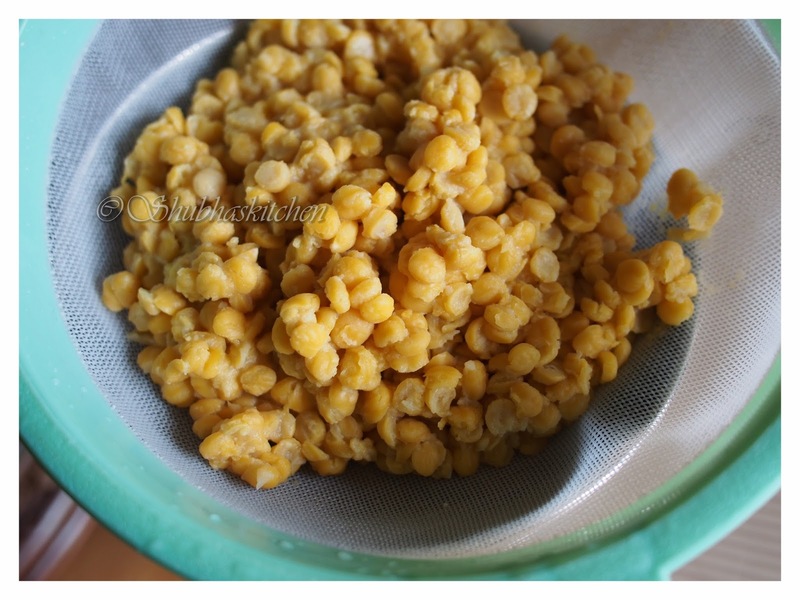 Wash and soak the chana dal in enough water for about 2 hours. After 2 hours, drain the water and add 3 cups of fresh water to it and pressure cook for about 4-5 whistles or until the lentils are cooked. 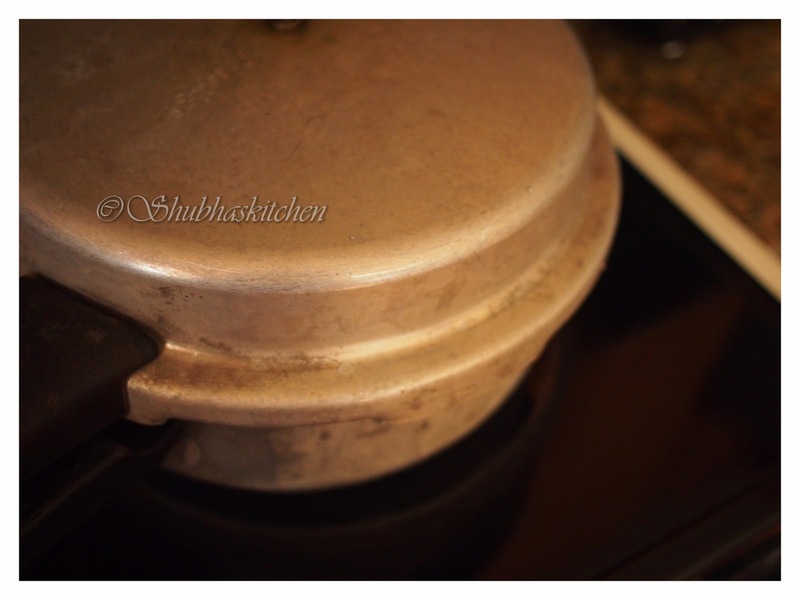 As an alternative , you can cook the lentils in enough water over the stove top but it takes a longer time. 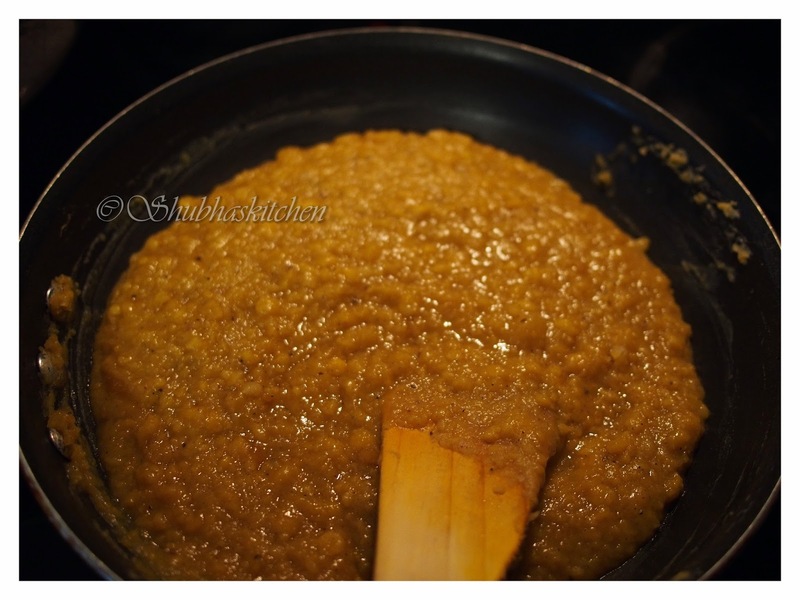 Once the pressure eases, open the pressure cooker lid and take out the dal. 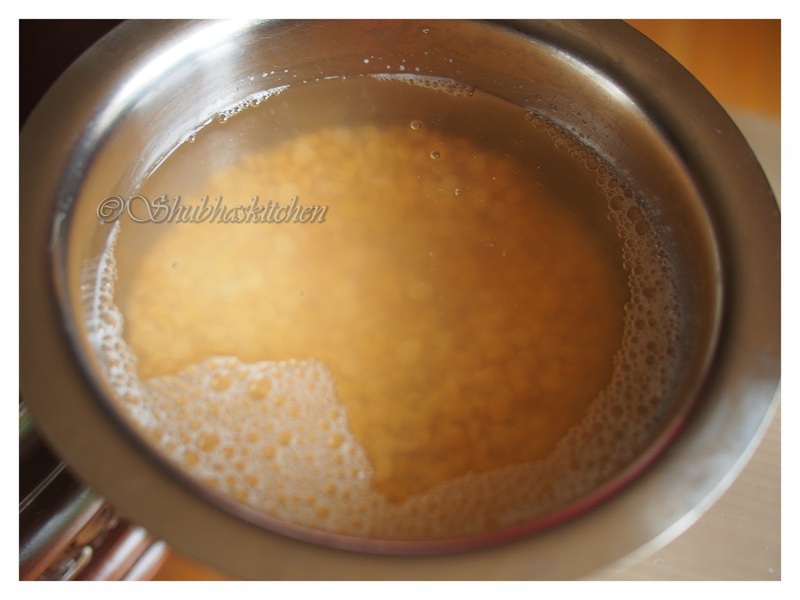 Drain the water from the lentils by pouring the lentil mixture through a strainer. 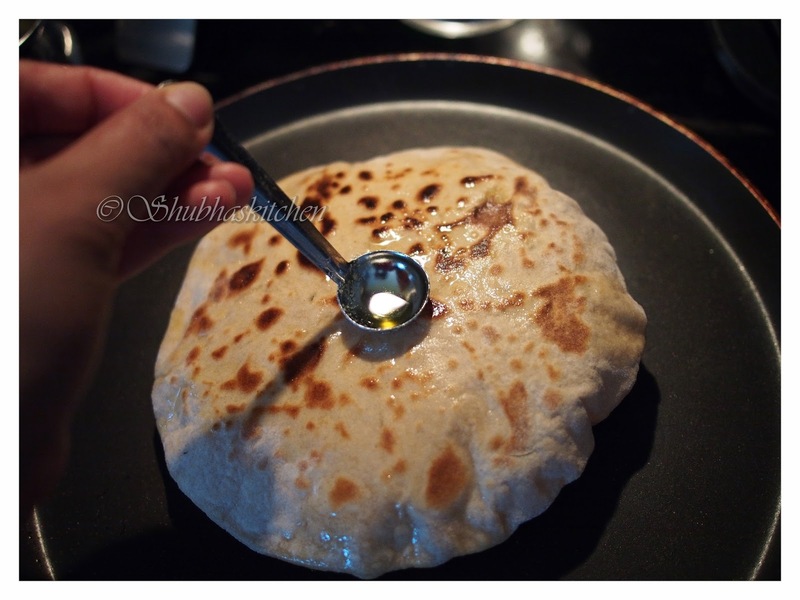 Reserve the liquid to make "Katachi Amti" - a thin gravy that is served with puran poli. 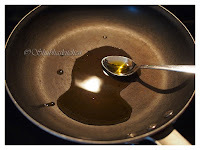 Now heat a thick bottomed pan. 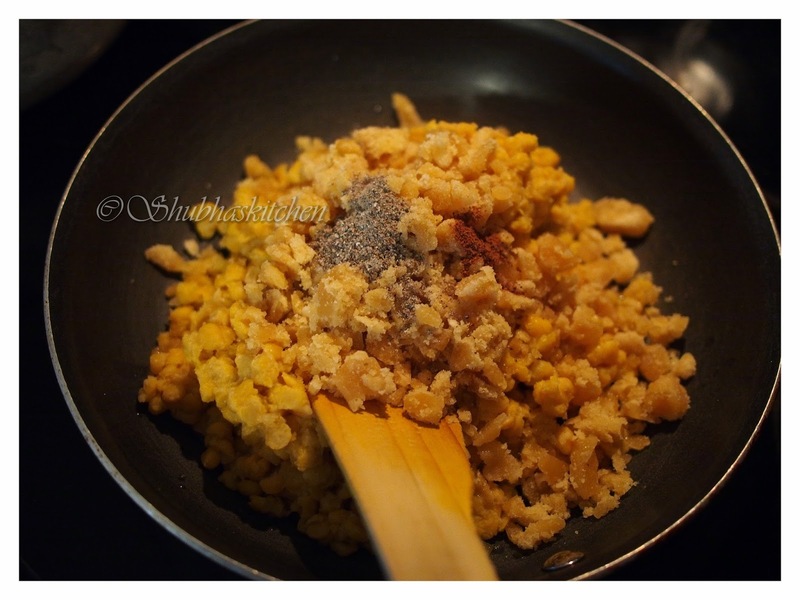 Add 2 tsp ghee/ clarified butter to it. 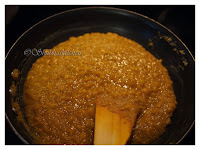 To this, add the starined lentil /dal. Add powdered jaggery, nutmeg powder and cardamom powder. 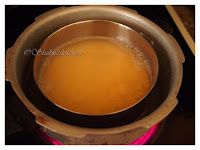 Cook this mixture on medium heat, stirring regularly.Cook till most of the moisture has evaporated and you arrive at an almost dry consistency. 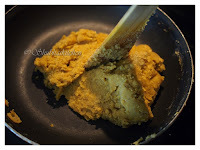 The best way to check the consistency is, if you place a spatula in the middle of the mixture, the spatula should stand freely. 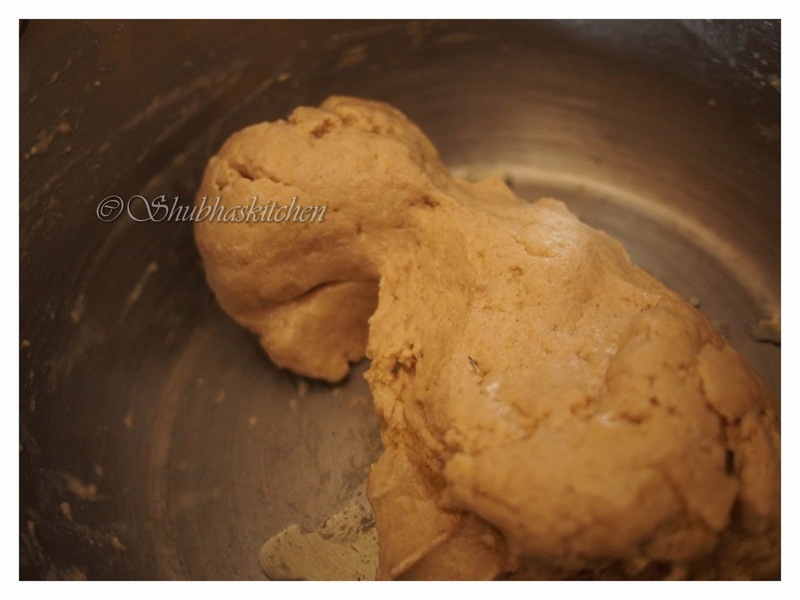 Once you arrive at the right consistency, turn off the hear and set the mixture aside. 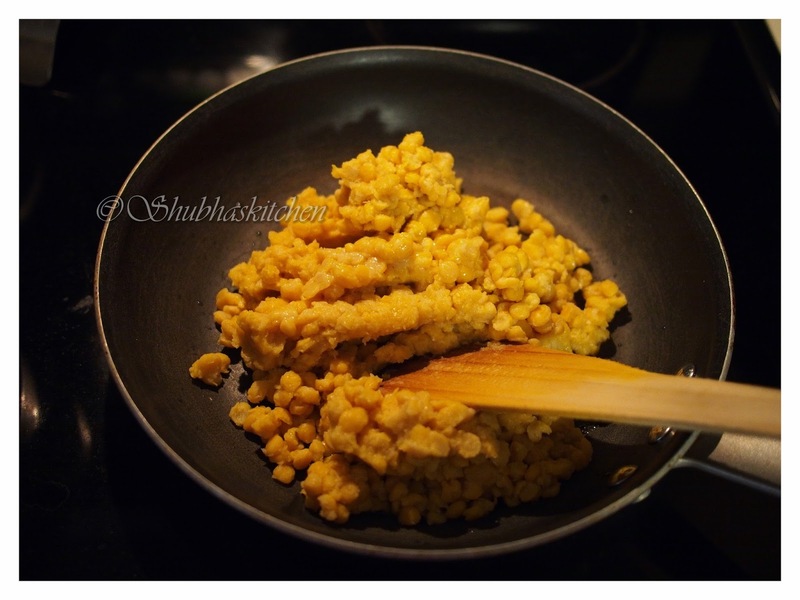 Once cooled, make 9 balls from this lentil mixture and set it aside. 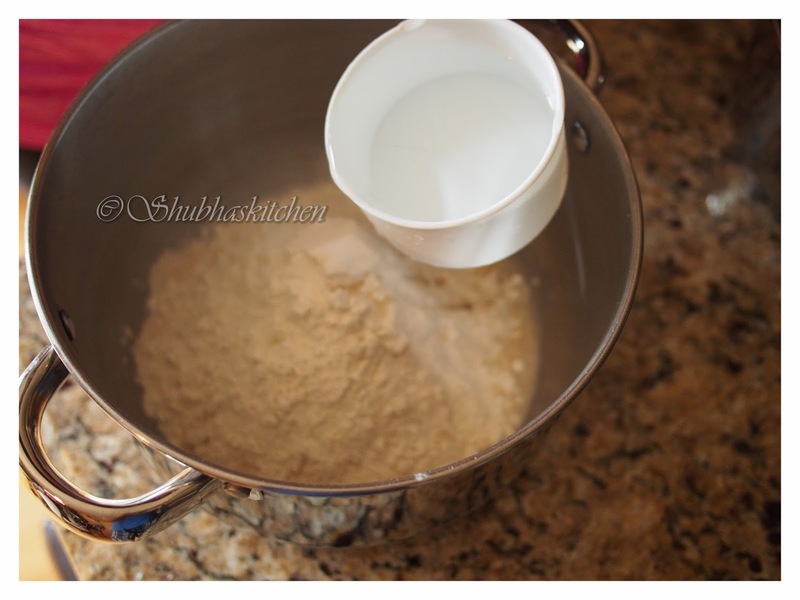 Take the wheat flour and all purpose flour in a big bowl. 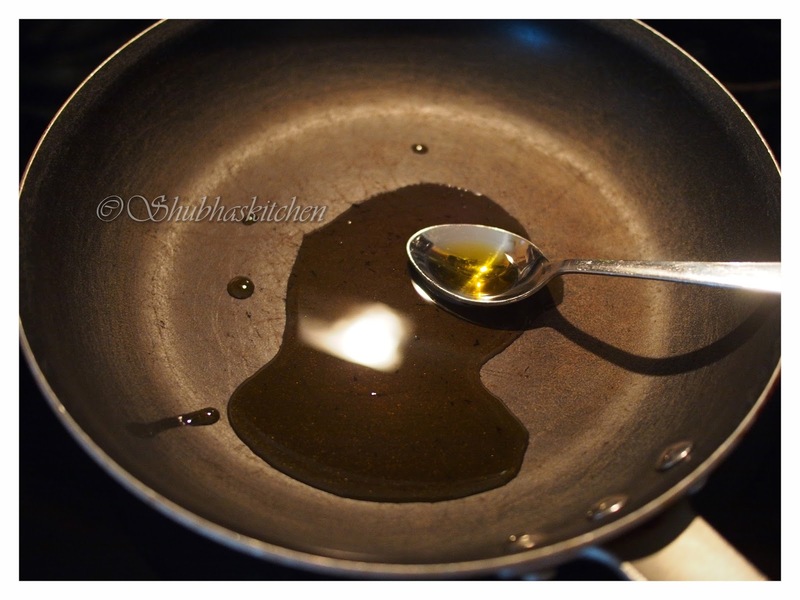 Add salt and give it a mix. Slowly add water little by little to form a smooth and soft dough . 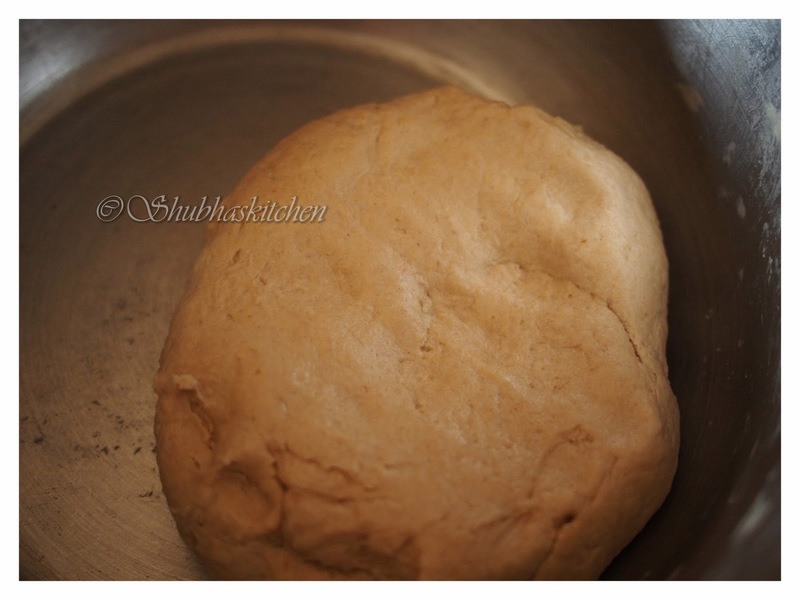 (I used approximately 1 cup of water).Lastly add 2.5 tbsp of oil and give it a final knead. 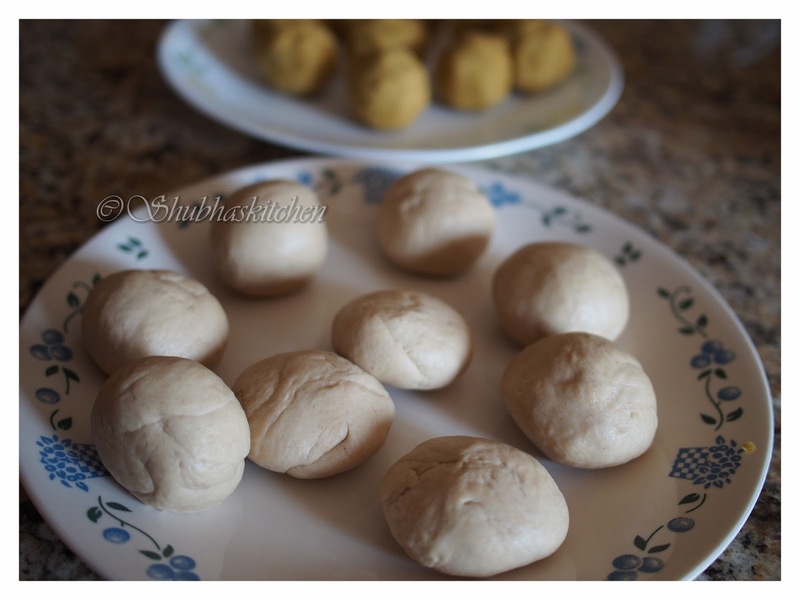 After sufficient resting, divide the dough in to 9 balls. 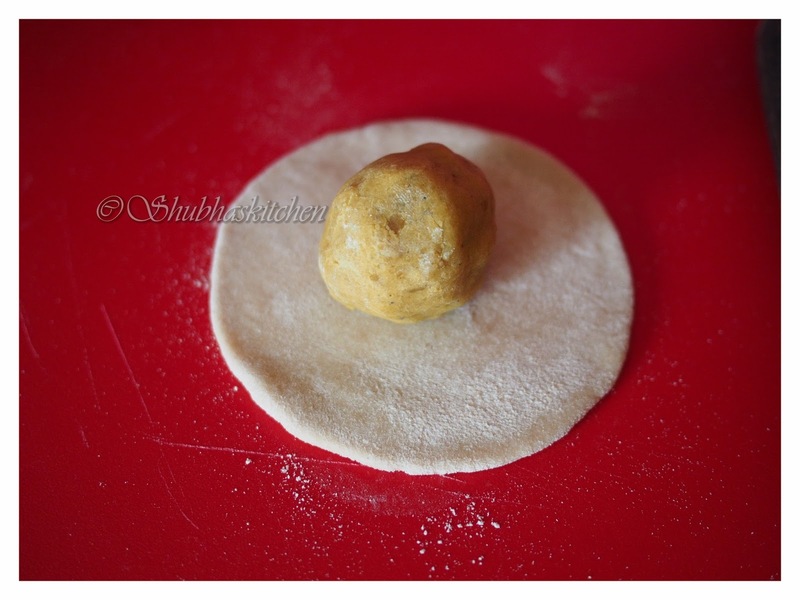 Take a ball of dough. 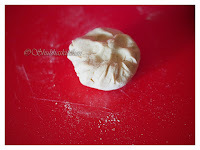 Dust it with some flour and roll it in to a small circle about 2.5 inches diameter. 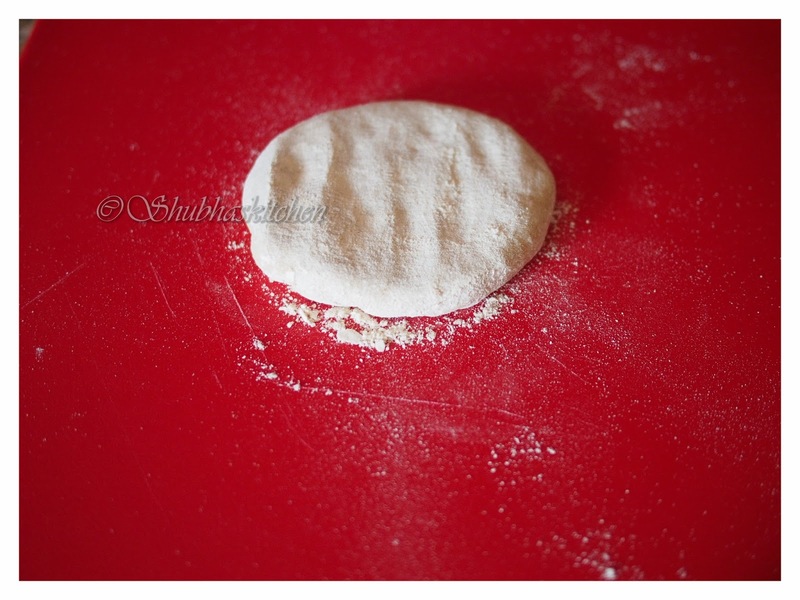 (Use little four flour for dusting. Too much leads to hard flatbreads). Place the lentil stuffing inside. Carefully bring the edges closer and join them. This way the filling gets sealed inside the dough. Heat a pan. 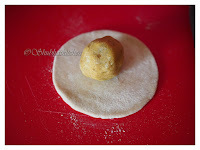 Once hot, put the rolled poli / dough. 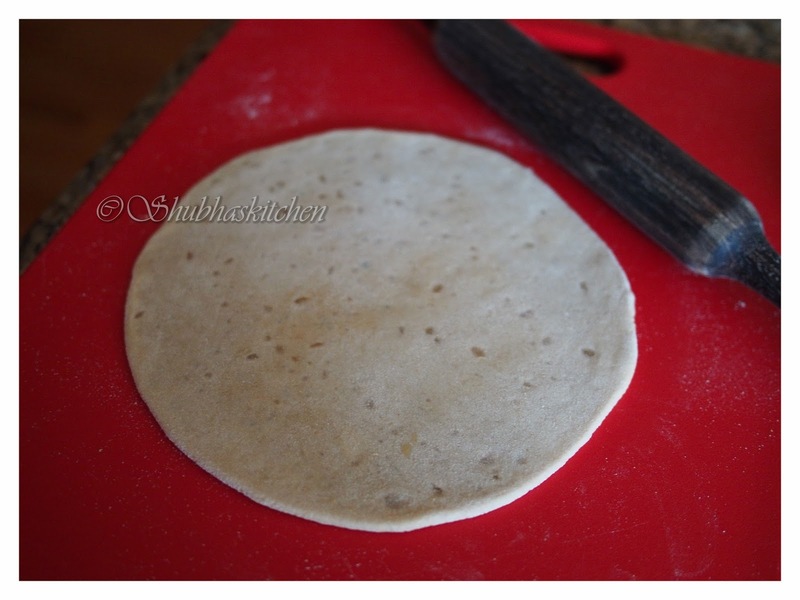 Once the bottom side gets brown spots, flip it over and cook the other side. Once the second side too gets brown spots, add some ghee on the top surface and spread through out surface. 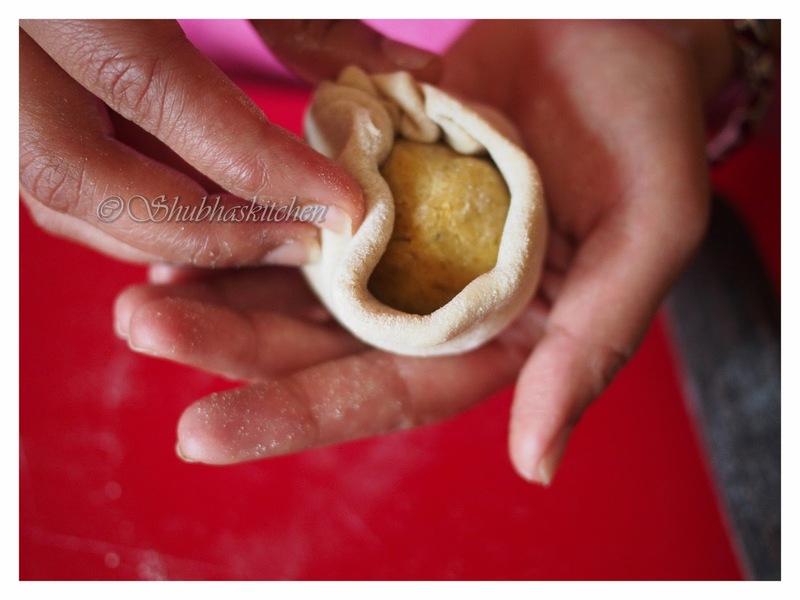 If you have rolled the dough well, you should see the bread puffing up at this point. 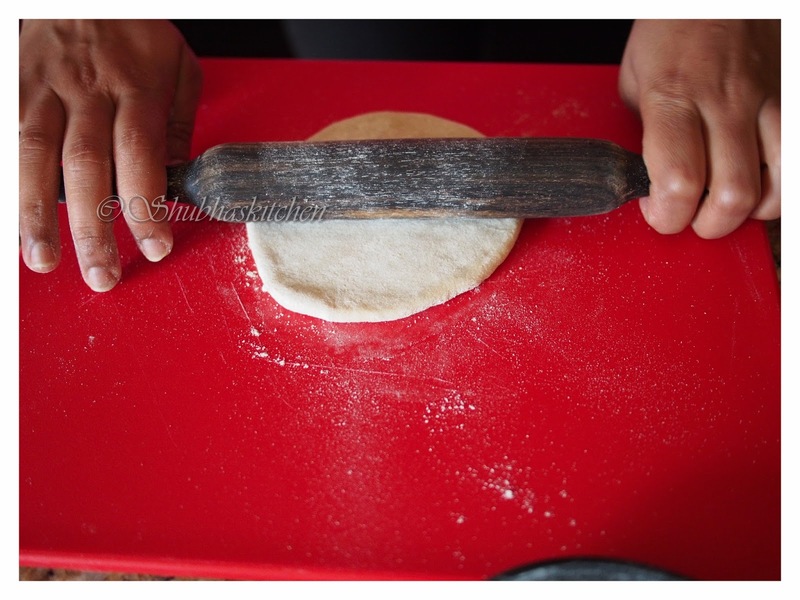 Flip and apply the ghee on the other side too pressing the poli / bread with a flat spatula so that it is cooked evenly on all sides. Once done, remove from the pan and store it covered in a casserole (to retain the heat). 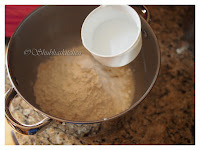 Make all the other polis/ bread in a similar way and keep stacking them in a casserole. 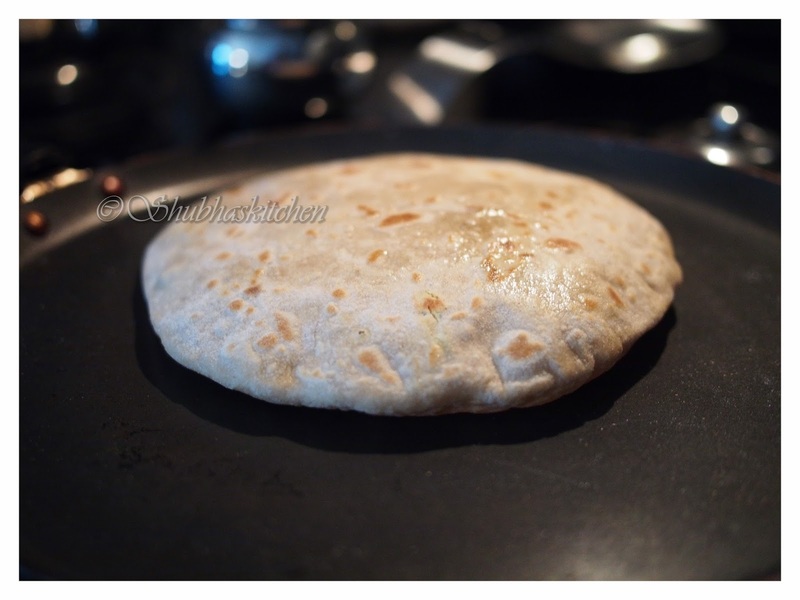 Apply some ghee on the Puran poli and serve . The dough should be very smooth and soft. 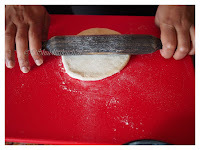 The application of oil to the dough is very important for getting soft Puran Polis. 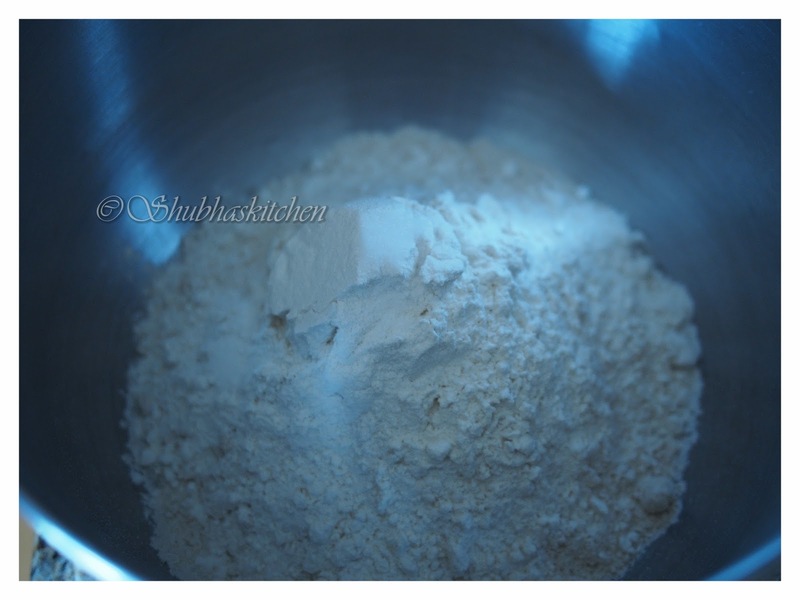 Do not use too much flour for dusting. Too much flour while dusting can lead to hard flat breads. Mash the filling really well to make a smooth filling. 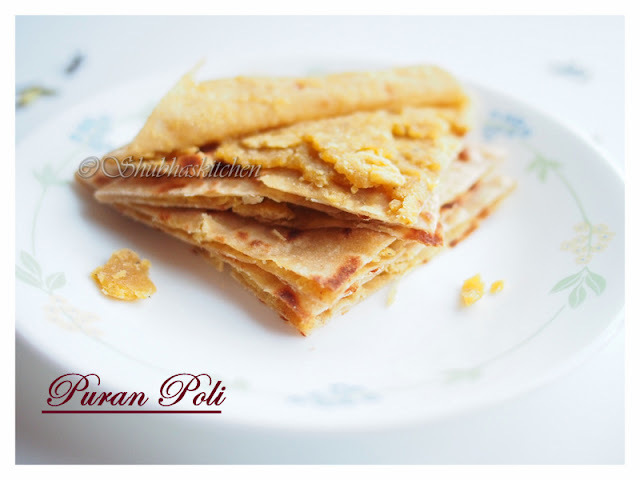 I love puran poli...it looks delicious & lovely recipe dear !! 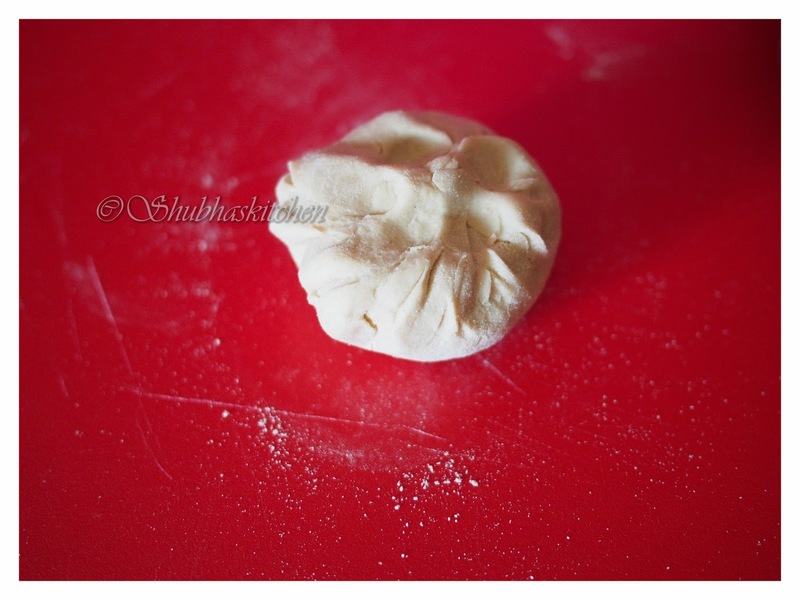 The filling is my all time fav. 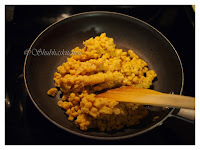 Love the flavours and with ghee, oh so awesome. I love Puran poli and this looks so tempting! love the addition of nutmeg!! What a beautiful puran poli. 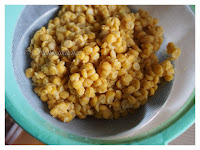 I have never tried this but definitely love to. 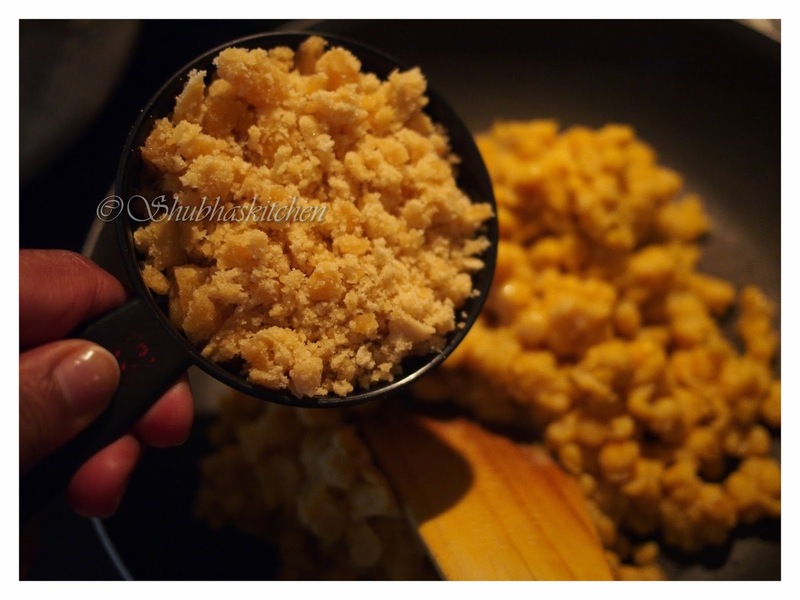 Nice recipe dear !! 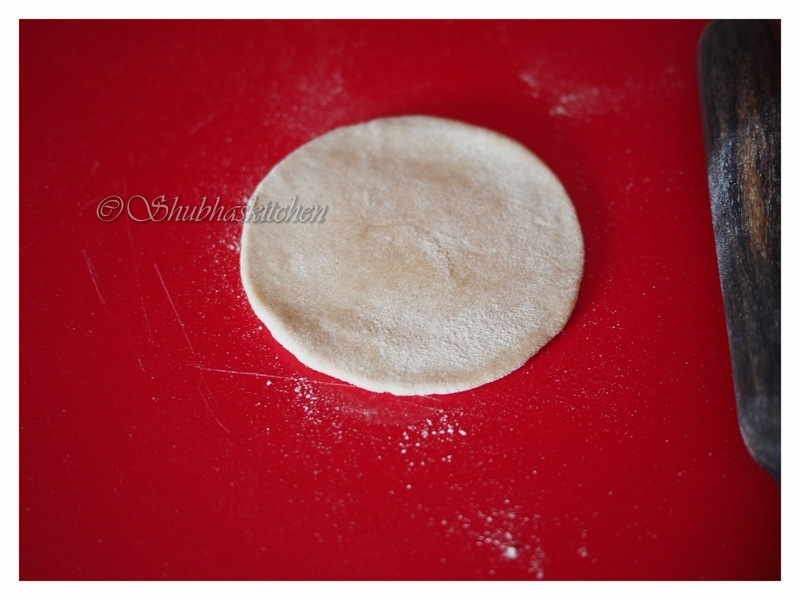 Shubha, very delicious share! I'm loving all the step pictures!